Even though they've been off the air for more than 25 years, Captain Jinks and Salty Sam can still draw an audience. Upward of 30 fans and family members attended a casual ceremony Saturday afternoon at Springdale Cemetery for the unveiling of a gravestone for the two stars of "The Captain Jinks Show" that was broadcast on WEEK-TV. "I remember we'd watch it at 4 o'clock every afternoon," Joe Maier said. "The humor was corny ... but when you're a little kid, that's what you like." Maier left Peoria to attend college, but resumed watching the show after he returned. "We had a son, and I used to watch it with him," Maier said. "I don't know, I might have liked it more than he did." 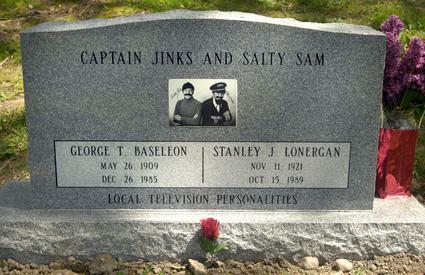 The monument marks the grave of Salty Sam, aka George Baseleon. It was paid for by donations from individuals and businesses in the Tri-County Area. Baseleon died in December 1985. His grave was unmarked until Saturday. "We came about a year ago to try and find the grave," said Gus Baseleon, George Baseleon's cousin, who lives in the Chicago suburb of Manhattan. "I asked (former cemetery manager) Pat Lewis if he remembered 'The Captain Jinks Show,' and he did. So he went up to find the grave and couldn't believe it was unmarked." Four of George Baseleon's family members, including his mother, are buried in adjacent plots. Captain Jinks, aka Stan Lonergan, died in October 1989, and his ashes were spread across Peoria. "Because Jinks was cremated, it was only fitting that both names be on the headstone," Gus Baseleon said. Fundraising for the monument started in August 2008, after Gus Baseleon's first trip to Springdale. Because of the overwhelming response, more than enough money was raised. "The outpouring for George was so great we not only got a headstone ... but we were able to donate ... to St. Jude (Children's Research Hospital)," WEEK-TV General Manager Mark DeSantis said. "Today, we have more computer-generated characters. ... I don't know if we have icons like this anymore." Because of Captain and Salty's appeal to children, it made sense to donate the extra funds to St. Jude, DeSantis said. "I still get calls asking about pictures or video from the show," DeSantis said. "(That is) a testament that these guys touched so many people." Gus Baseleon said he can't get over the support exhibited by the community. "I still get letters," he said. "I really feel the warmness of the people in the Tri-County Area."